Remote shortcutting job is a special job type, which is used together with the file archive job. This type of job is used if you have several remote locations synchronized with your central data center, you are archiving files in the data center with a File system archive job and the remote files should be replaced by shortcuts (by the Remote shortcutting job) to spare storage space on the remote shares. contentACCESS is installed on the data center and continuously archives the files already copied to the data center. So, the archiving itself is done by a standard File system archive job; the Remote shortcutting job is used to create shortcuts on the remote shares. Archiving from the data center can be done with the shortcutting, journal or with the keep original method, so all types can be used. Note: Remote shortcutting job can replace remote files with shortcuts only in case if the matching file in the data center (where contentACCESS is installed and file archive job is running) has been already archived. The modification date of the remote file and data center-file must be the same, too, otherwise the shortcutting job will skip the file and will write this information into the .log file. The last picture illustrates how the shortcuts on the remote share are synchronized with the data center files (i.e. the data center files are also replaced with shortcuts). Navigate to File Archive ⇒ Archive ⇒ Jobs button, click on +new. In the Add new job instance dialog select Remote shortcutting job from the Available jobs: dropdown list. Select the node, where the job should run, from the Run on node list. Now we would not like to specify a node, so we select “Any available”. Name it and click on Add. Enter the server name, where the virtual drive has been installed (DNS alias at best). Virtual drive will be used to open the shortcuts linking to the archived files. By using the “Use default” option, the Virtual Drive that was already configured on the Virtual Drive configuration page will be automatically preselected. It is recommended to use this option, because if the settings have been changed on the Virtual Drive configuration page, the value will be automatically used by the job, too, without a need to change the job’s settings. In this section the user needs to specify the remote share(s) containing the files to be replaced with a shortcut. It is also possible to specify multiple remote shares. Only the remote file path(s) specified on the Aliases page will be listed in the dialog. (For more information about configuring aliases refer to Configuring aliases). Click on +new and the Remote file path dialog will open. Unroll the Alias dropdown list and select the alias that the job should use. The relative folder path must be set in the Path extension text box. This configuration enables for the user to filter among items to be shortcutted by 3 types of criteria: by age, size or file type. It is also enabled to use more filters simultaneously. For filtering documents according to any of these criteria, activate the filter button by checking the checkbox next to it, then click on the activated button. With this filter the user may configure, how old files should be processed by the shortcutting job. The user has multiple choices here; he can a) use either the Use dates option and pick up a date from the calendar, or b) he can enter a value into days/months/years textbox to process the files which are younger than/older than or fall into time interval set here. The shortcutting job is checking if the modification date of the remote files is the same as the modification date of the data center files. If the dates are the same, the job replaces the remote files with a shortcut; if the dates are different, it skips the remote files and writes this information into the .log file. As we would like to replace remote files older than 1 year with shortcuts, we set “Modification date is older than” 1 year in the Age filter repository window. This filter can be used if you would like to replace with shortcuts only files of a certain size. To use it, activate Size filter button by checking the checkbox next to it, then click on the active button. In the Size filter dialog choose from the filtering types (Bigger then, Smaller then, or Between values), enter the size (in kilobytes) and click OK. If the user would like to process all files of the remote share, he can skip this filter settings (like in this use case as well). Important!!! : When the user changes the file content, e.g. deletes a picture from the file and saves it to the original location, (and thus the file size will be reduced e.g. from 110 to 85 kB) and file size filter is set on >100 kB, then the shortcutting job will not process the newly created item by the next processing. The newly created item will be saved in the remote location and the old shortcut will be present in the remote location, too, which will still link to the old file without any changes. For this reason, it is recommended to always check the size filter settings, if a file has not been replaced by a shortcutting job. File type filter: This filter was improved to select certain file types for processing. For filtering between documents according to this criteria, activate File Type filter button by checking the checkbox next to it, then click on the active button. 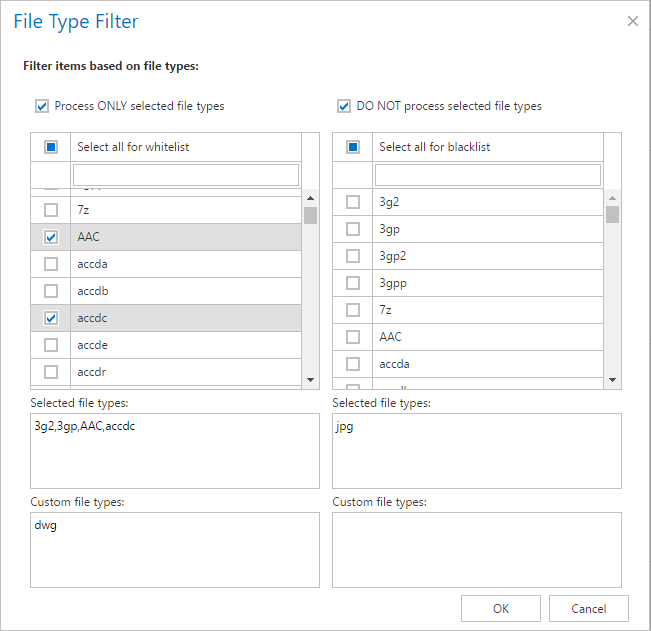 In the File Type filter dialog the user may select the file types that need to be processed (option Process ONLY selected file types), or he may specify file types that should be excluded from the processing (DO NOT process selected file types). The file types selected in the whitelist/blacklist are displayed below the grid in a read-only text box. Any file types (also file types that are not included in the whitelist and/or blacklist) can be specified in the Custom file types text box (in this use case “dwg”). If nothing is selected/deselected from the file types, then every file type will be processed automatically. If you need to process all files on the remote share, skip these settings. Select here, if you need to get notification emails from the Remote shortcutting job, and in which cases you would like to get such email message. Into the Recipient list textbox insert the email addresses of the people, whom you would like to send these emails to. Set the value, which will determine how many items will be processed simultaneously by the job. The recommended value is 2, as in our case. Never forget to save your job configurations at the end: click on Save in the left upper corner of UI.